From how to clean your boat biminis to fabric comparison to how to measure your boat for the best bimini fit, we've got you covered with comprehensive Help Guides, bimini top articles, and customer reviews. We're standing by and welcome the opportunity to get to know our customers whenever possible. Feel free to give us a call, send us an email, or chat with us online. We're here to help with all your bimini top needs! Our comprehensive help guide about the bimini top for boats is here to assist with your bimini cover selection and fabric choice. It also includes important basics like how to measure for a bimini top and general bimini maintenance. Let us help point you in the right direction for shade and sun protection aboard your favorite watercraft. What does 2, 3, and 4 bow mean? The bows of the bimini top are the parts of the frame that connect from side to side over the width of the boat. 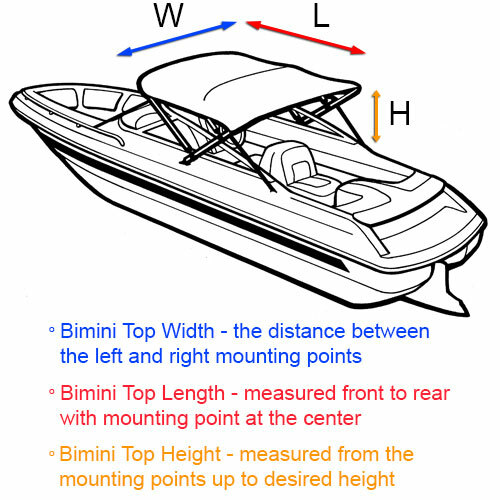 Bimini tops are equipped with either 2, 3, or 4 main bows. The smallest style offered—mostly used for shorter Jon style fishing boats, V-hull fishing boats, and inflatables—is the 2 bow bimini top. 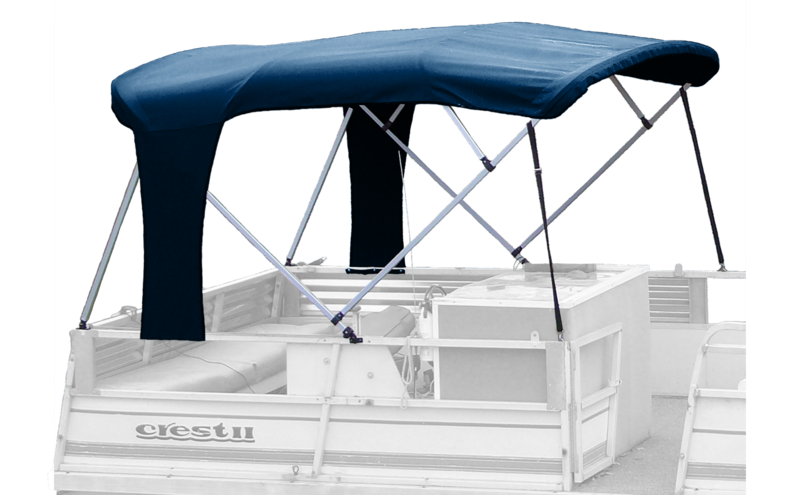 The most commonly used bimini top is the 3 bow. This bimini top style is recommended for V-hull runabouts, ski boats, performance boats, and most center consoles. The largest bimini top carried by SavvyBoater is the 4 bow, which is reserved for larger boats, such as pontoons or deck boats. How do I mount my bimini top? For standard bimini tops drilling is required, as the bimini is mounted onto the top or on the outside of the boat. For pontoon bimini tops, which are mounted onto your pontoon’s side rails, drilling is also required. For tower bimini tops no drilling is required. Instead, the bimini clamps directly onto the boat tower itself. How fast can I go when my bimini top is deployed? You can safely deploy and use your Carver bimini tops while operating at speeds of up to 35 MPH, and up to 45 MPH for Westland. If you would like to go faster with your top up, we recommend thru-bolting. How do I thru-bolt my bimini top so that I can go faster than 35 MPH with it up and in use? If you have nylon fittings you’ll first need to replace them with stainless steel fittings. The next step is to thru-bolt the connection points of the bimini to the boat—the front and rear eye straps, as well as the deck hinge. In order to thru-bolt, you’ll need a longer bolt that travels completely through the fiberglass and reaches to the underside. For added stability and security, we recommend adding an extra washer and nut. Lastly, check the top for stability, ensuring the front of the top is angled downward. If it isn’t, pull the front hold-down straps tight in order to change the angle. As always, check all straps and fittings for tightness before using your bimini top at speeds higher than 35 MPH. *Note: Thru-bolting will allow you to operate your boat at speeds of up to 45 MPH with the top still up. Keep in mind wind speeds and adjust your speed accordingly. Whenever trailering your boat, your bimini top should be laid down flat. First choose where you want to mount your bimini top. The most common mounting point is at the widest part of your boat. If this won't work, then move the bimini mounting points forward or back to accommodate. Make sure not to measure up and over or around obstacles. As bimini tops come in a range of widths, choose the range in which your width measurement falls. The bimini top will measure in the middle of the range, but can be flexed in or out. The mounting point is the center of the bimini top, so the top will extend half its length in front and half its length behind the mounting point. A 6 foot top will cover 3 feet forward, and 3 feet behind the mounting point. Check to see if your new bimini might conflict with existing antennas or ski pylons. Measure straight up from the mounting point. Keep in mind that the total standing height is the height of the bimini top plus the height from the floor to the mounting point. In order to determine what height you should get, remember to consider how much clearance you want underneath the bimini. With a 36 inch bimini, the support bows will cross the boat 36 inches above the mounting point. A 36 inch bimini that is mounted 20 inches above the floor of the boat will have 56 inches of room underneath. A tower bimini gets measured similar to the way a standard bimini does, only with a few key differences. This bimini will only mount to the tower, which means no moving it forward or back in the boat. Because of the no-drill installation the tower bimini is easily adjusted higher or lower on the tower. Brace Kits hold your bimini top up and out of the way when folded. Braces also give your bimini a more stable position when open. Brace kits come with two braces and mounting hardware that works seamlessly with your bimini top. Slide tracks mount to the gunwale of your boat and allow your bimini top to slide into a more convenient, horizontal storage position. Bimini top slide track kits come with two tracks and all the necessary mounting hardware. Will my bimini top lay down flat? Standard 2, 3, and 4 bow bimini tops come with mounting brackets that allow the bimini to lay flat when not in use. Optional Brace Kits are specifically designed to hold your bimini top up and out of the way when it's folded and not in use. As an alternative to braces, Slide Tracks allow a retracted bimini top to easily slide into storage position. Bimini top towers can also be folded down or removed for storage. When I lay my bimini top down, where will it land on my boat? When you lay your bimini top down, it will elongate. This is due to the way the metal bows nestle together. If you intend to fish from your boat while your bimini top is down—or if you have other equipment stored in your boat—this could cause an issue with space. Below we list each Carver bimini top height, and how long that top will be from the mounting point to the top of the canvas when it is laying down flat in your boat. Can I replace the fabric portion only on my Bimini top? Yes, you can replace the fabric portion on your bimini top! To find one that works for your boat, take a look at the Carver Replacement Canvas section in our bimini top accessories. Carver's bimini top replacement canvases are made for pontoon bimini tops that measure 48" or 54" high and come in lengths of 8', 9', or 10'. The canvas is made to fit a bimini top that mounts to the boat somewhere between 91 and 102". The replacement canvas also comes with zippered sleeves and a cut-out for the running light, allowing you to easily fit it to the frame without having to remove anything. How do I clean my bimini top? When it comes to bimini top cleaning, there are several directions you can go. Below are two options that involve a combination of household ingredients and easy-to-follow instructions. Mix and apply to mildew spots, letting it sit for no more than 10 minutes. Scrub with a soft bristle brush and rinse well, allowing the fabric to dry completely. Fully wet the fabric and then scrub it down with a soft brush or cloth, give it a good rinse, and allow the fabric to fully dry. Apply Fabric Guard to the clean, dry surface to protect the fabric from the elements and extend their life. If you're using your bimini top in saltwater, make sure to properly clean it after each saltwater outing to prevent rust or corrosion. To clean your bimini top after saltwater use, it's best to remember a few key points. Hose it down to remove all traces of saltwater from the frame and canvas. As described above, create a mild solution of dish soap and water, then use a soft brush to clean the bimini top frame. You can also clean your bimini frame with a quality car chrome polish, followed by a fiberglass wax. Steer clear of cleaners that contain chlorine or powders/pads that are made for scouring, as you don't want to scratch the frame. You can use a commercial grade rust remover on your aluminum frame, so long as the rust remover is made specifically for aluminum.